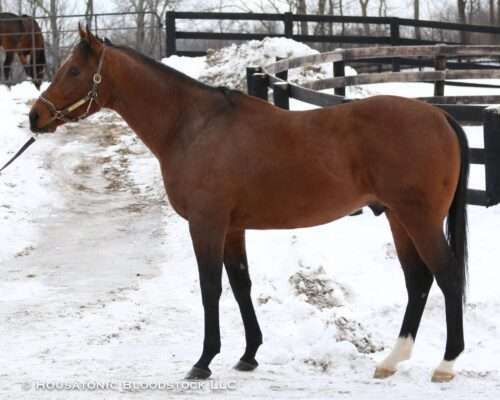 Magical Point, a daughter of Horse of the Year Point Given and from the fantastic Maryland female family of Illeria, will visit the impeccably-bred, incredibly-fast Redesdale this year during his first season at stud, in a Housatonic Recommended Mating. Magical Point is a half-sister to the stakes winner Candida H., both of them out of stakes winner Magical Broad, by Broad Brush. Magical Broad is one of four stakes-winning full-siblings, including Grade 1 winner and top class sire Include, plus Grade 3 winner Magic Broad. There were also two additional stakes-placed full-siblings, and a three-quarter brother (by Broad Brush’s son Concern) also earned black-type. Magical Broad, Include, Magic Broad and Encaustic are all inbred 4x4x4 to Turn-To, and we believe that the consistently successful results of this tribe are a result of this specific genetic concentration — so we think it makes sense to plan a mating with a stallion that should compliment this blood. Magical Point’s dam is inbred 4x4x4 to Turn-To through two of his daughters and through his son Hail To Reason, he the sire of Grade 1 winner Halo and grandsire of Group 3 winner/Group 1 producer Coup de Folie, both from Redesdale’s female family. As such, we think that this reverse cross of those lines could bear fruit here, especially since Coup de Folie’s broodmare sire is Hoist the Flag, who is also the broodmare sire of Magical Point’s own broodmare sire, Broad Brush. Furthermore, Speightstown has sired the stakes winner Raucous from his only foal out of an Include mare, while sons of Speightstown have combined with daughters of Include to produce four foals of racing age, of which one is a stakes winner — so those are pretty impressive results from an admittedly small sample size. We also think that the speed that Redesdale possessed — which he comes by honestly through his pedigree — will compliment the quickness demonstrated by several of Magical Point’s close relatives, as Candida H. and Magical Broad were both stakes winners going 7 furlongs (even if some of the other members of this family were better going longer). And the soundness demonstrated by Point Given, Thunder Gulch and Illeria’s brood by Broad Brush will be an excellent counterpoint to Redesdale, as well. Although he didn’t make his racetrack debut until May of his 3-year-old season (not totally unexpected for a son of Speightstown), Redesdale got off to a quick start by taking that 6 furlong Churchill Downs maiden special weight in 1:09.86 after a 3-wide trip. That was good for an 87 Beyer Speed Figure, and immediately had his connections dreaming of the likes of the King’s Bishop Stakes-G1 that summer. Unfortunately, Redesdale went to the sidelines after his initial victory. He eventually resurfaced the following January at the Fair Grounds, where he put together back-to-back allowance victories in January and February, both at 6 furlongs in 1:09 and change, the latter by four lengths over stakes winner Speightsong, earning a 95 Beyer. Redesdale did make one more start, but emerged from the Grade 3 Commonwealth Handicap with an injury that sent him to the shelf again, and although connections made an attempt to bring him back to the races as a 5-year-old, it didn’t pan out and Redesdale retired to stud with three wins from four starts, good for $90,300 in earnings. As much talent as Redesdale showed on the track, it is his pedigree that makes him as exciting a stallion prospect as we believe him to be. He is by Speightstown, a top-class stallion and rising sire-of-sires, whose sons at stud already include the likes of Munnings, Jersey Town and Poseidon’s Warrior (all sires of Grade 1 winners) and 2018 Top Five Freshman Sire Central Banker. And even more intriguingly, Redesdale’s dam, the Graded stakes-winning sprinter Harpia, is a full-sister to Danehill, a Group 1-winning sprinter and the all-time world-wide leading sire of stakes winners (with 349) and Grade/Group 1 winners (with 89), whose legacy continues to grow through his stallion sons and broodmare daughters. Furthermore, Harpia’s dam, Razyana, is out of Spring Adieu, a half-sister to the breed-shaping stallion Northern Dancer and to Raise the Standard (the dam of Group 3 winner Coup de Folie, mentioned above, she in turn the dam of champion and important stallion Machiavellian), all three of them out of Natalma — and since Danehill and Harpia are by Danzig, a son of Northern Dancer, the pair are inbred 3×3 to Natalma. Natalma is, in turn, a half-sister to Cosmah, the dam of Grade 1 winner and leading sire Halo (as mentioned above, a son of Hail To Reason). In addition to the deeper pedigree thoughts set forth above, the TrueNick rating system gives this match a B+, based on the cross of Gone West-line stallions over Thunder Gulch-line mares. And when combined finally with the fact that Redesdale’s strong-bodied and well-balanced physique should help tidy up Magical Point’s slightly more angular frame, we think this match has every right to produce a top class foal.